66/7 Hull £1.50; 67/8 Hull £1.50; 69/70 Preston £1; 73/4 Coventry (LC), Hull, Oxford; 74/5 Cardiff, Southampton; 75/6 Hull; 76/7 Birmingham, Ipswich, Leicester, Man C, Man Un, Middlesbrough, QPR, Stoke, Sunderland; 77/8 Birmingham, Bristol R (Gloucs Final), Derby, Ipswich, Man C, Man Un, Norwich, Nottm F, Stoke (LC), WBA; 78/9 Bolton (FAC), Coventry, C Palace (LC), Derby, Ipswich, Leeds, Man C, Middlesbrough, Norwich, Nottm F, QPR, Wolves; 79/80 Arsenal, A Villa, Bolton, Coventry, C Palace, Derby, Derby (FAC), Ipswich, Liverpool, Man C, Middlesbrough, Norwich, Nottm F, Nottm F (LC), Rotherham (LC), Southampton, Stoke, Tottenham, WBA, Wolves; 80/1 Birmingham (LC), Bolton, Bristol R, Cambridge, Cardiff, Carlisle (FAC), Chelsea, Grimsby, L Orient, Luton, Notts C, Preston, QPR, Sheff Wed, Shrewsbury, Swansea, Watford, Wrexham; 81/2 Bristol R (Gloucs Cup), Carlisle, Chester, Gillingham, Oxford, Preston, Walsall (LC); 83/4 Chester, Stockport; 84/5 Bournemouth, Cambridge, Doncaster, Hereford (FRT), Plymouth, P Vale (FRT), Reading, Walsall; 85/6 Bolton, Bury, Gillingham, Lincoln, Newport, Plymouth (FRT), Rotherham, Swindon (FAC); 86/7 Blackpool, Bristol R (FRT), Darlington, Fulham, Gillingham, Gillingham (FRT Southern s/f), Mansfield, Newport, P Vale, Rotherham, Southend (FRT); 87/8 Aldershot, Blackpool, Brentford, Bristol R, Bury, Chester, Chesterfield, Fulham, Gillingham, P Vale, Preston, Rotherham, Southend, Swansea (FRT), Swindon (LC); 88/9 Aldershot, Aldershot (FAC), Bolton, Bristol R, Cardiff, Chesterfield, C Palace (LC), Exeter (LC), Oxford (LC), P Vale, Reading, Sheff Un, Southend, Southend (FAC), Swansea, Wolves; 89/90 Blackpool, Bolton, Bristol R, Bristol R (Gloucs Cup Final), Bury, Cambridge (FAC), Chester, Crewe, Fulham, Fulham (FAC), Huddersfield, L Orient, Mansfield, Northampton, Notts C, Notts C (LDC), Preston, Reading, Reading (LC), Rotherham, Shrewsbury, Swansea, Tranmere, Walsall, Wigan; 90/1 Bristol R, Hull, Middlesbrough, Millwall, Newcastle, Notts C, Portsmouth, P Vale, Sheff Wed, Sunderland (LC), WBA (LC); 91/2 Barnsley, Bristol R, Bristol R (LC), Bristol R (Gloucs Cup Final), Derby, Middlesbrough, Newcastle, Portsmouth, P Vale, Southampton (ZDS), Southend, Swindon, Tranmere, Wolves; 92/3 Bristol Rovers, Cardiff (LC), Grimsby, Leicester, Luton, Millwall, Newcastle, Notts C, Oxford, Peterboro, Southend, Sunderland, Swindon, Tranmere, Watford (AIC), West Ham; 93/4 Barnsley, Birmingham, Bolton, Bristol Rovers (Gloucs Final), C Palace, Leicester, Millwall, Southend, Sunderland, Swansea (LC); 94/5 Barnsley, Burnley, Grimsby, Luton, Southend, Stoke, Watford, Wolves; 96/7 Preston, Watford; 97/8 Blackpool, Bournemouth, Bristol Rovers (LC), Fulham, Leeds (LC £1.20), Luton; 99/00 Blackpool, Bournemouth (Auto), Bury, Chesterfield, Luton, Mansfield (FAC), Notts C, Wycombe; 00/1 Bournemouth, Brentford (LC), Notts C, Peterboro, Reading, Swindon; 01/2 Chesterfield; 02/3 Barnsley, Peterborough; 03/4 Notts C; 04/5 Bournemouth, Chesterfield, Colchester, MK Dons (LDV), Oldham, Peterborough (LDV); 06/7 L Orient. EURO COMPS (Homes) – 92/3 v Cosenza (AIC), Reggiana (AIC). FRIENDLIES & TESTIMONIALS (at Home) - 75/6 Hereford (Drysdale Test); 76/7 Bristol R (Tainton Test); 78/9 Malmo; 84/5 WBA (Shaw Test); 88/9 Southampton, Swindon; 89/90 Man United £1.25; 91/2 Steaua Bucharest; 92/3 Chelsea, Man United (Garland Test); 97/8 Everton (Centenary) £1.50; 99/00 Man City. v NON LEAGUE (at Home) – v Aylesbury (FAC) 87/8 £1. SEMI-FINALS (at Home) – 88/9 v Nottm Forest (League Cup semi) £1.20; 77/8 v Hibs (Anglo Scottish semi). MATCHES AT BRISTOL CITY – 85/6 England Under 21 v Turkey; 80s Ipswich v Southampton (Ashton Gate 8 Benefit). at ALDERSHOT 88/9 (FAC 2nd rep) £1. ARSENAL 77/8; 79/80. BARNSLEY 90/1; 91/2; 93/4; 94/5; 02/3. BIRMINGHAM 78/9; 80/1 (LC). BLACKBURN 80/1; 91/2. BLACKPOOL 70/1; 71/2; 74/5; 89/90; 02/3. BOLTON 79/80; 80/1; 84/5; 96/7 (LC). BOSTON UNITED 02/3 (LDV - first League season) £1.50. BOURNEMOUTH 86/7 (LC); 96/7; 97/8; 01/2. BRIGHTON 79/80; 87/8; 91/2; 95/6. BRISTOL ROVERS 78/9 (Gloucs Final); 80/1; 81/2; 86/7; 87/8, 87/8 (Gloucs Final); 88/9 (SVT); 90/1, 90/1 (Gloucs Final); 91/2; 96/7. BURNLEY 81/2. BURY 89/90. CAMBRIDGE 89/90 (FAC), 89/90 (FAC 2nd rep); 90/1; 92/3; 99/0 (LC). CARDIFF 85/6; 89/90. CARLISLE 86/7. CHARLTON 67/8 £1.50; 68/9 £1.50; 69/70 £1; 70/1; 75/6; 90/1; 91/2. CHELSEA 80/1. CHESTER 81/2; 82/3; 86/7; 88/9; 89/90. CHESTERFIELD 85/6; 86/7; 96/7 (FAC); 99/00; 00/1 (FAC); 01/2; 04/5. COVENTRY 73/4 (LC); 75/6 (FAC); 79/80. C PALACE 67/8 £1.50; 78/9 (FAC). DARLINGTON 85/6. DERBY 91/2; 92/3; 93/4. DONCASTER 85/6; 87/8. EVERTON 76/7; 78/9; 79/80. FULHAM 68/9 £1.50; 73/4; 87/8; 89/90. GILLINGHAM 81/2; 85/6; 87/8; 88/9. GRIMSBY 80/1; 87/8; 92/3; 93/4; 94/5. HEREFORD 82/3. HULL 68/9 £1.50; 70/1; 73/4; 82/3; 95/6. IPSWICH 76/7, 76/7 (FAC); 77/8; 78/9; 90/1; 91/2; 98/9. LEEDS 78/9; 79/80. LEICESTER 70/1; 76/7; 77/8; 91/2, 91/2 (FAC); 99/00 (FAC). LEYTON ORIENT 89/90. LINCOLN 81/2; 84/5. LIVERPOOL 78/9; 79/80. LUTON 70/1; 71/2; 96/7. MAN CITY 76/7; 77/8; 78/9. MAN UNITED 76/7; 79/80. MANSFIELD 82/3; 86/7. MIDDLESBROUGH 93/4. MILLWALL 70/1; 71/2; 72/3; 73/4; 91/2; 99/00. NEWPORT 86/7 £1. NORTHAMPTON 88/9; 01/2 £1. NORWICH 76/7; 77/8; 78/9; 79/80; 90/1 (FAC); 07/8. NOTTM FOREST 78/9; 79/80, 79/80 (LC). NOTTS COUNTY 73/4; 74/5; 80/1; 89/90; 90/1; 92/3; 93/4; 94/5, 94/5 (LC); 95/6; 99/0; 00/1; 01/2 £1; 02/3. OLDHAM 80/1. OXFORD 73/4; 88/9 (LC); 91/2; 99/0. PETERBORO 79/80 (LC); 81/2 (FAC); 82/3; 83/4; 92/3; 93/4; 96/7; 00/1; 01/2 60p; 04/5. PLYMOUTH 86/7 (FAC); 90/1; 91/2. PORTSMOUTH 93/4. P VALE 86/7; 87/8; 88/9; 90/1; 91/2. PRESTON 66/7 £1.50; 67/8 £1.50; 68/9 £1.50. QPR 76/7. READING 88/9; 89/90, 89/90 (LC), 89/90 (LDC); 94/5. SCUNTHORPE 82/3; 99/00. SHEFF UNITED 86/7 (LC); 88/9; 92/3 (LC). SHEFF WED 07/8. SHREWSBURY 80/1; 95/6, 95/6 (Auto); 96/7; 98/9 (LC). SOUTHAMPTON 74/5; 79/80. SOUTHEND 81/2; 91/2; 93/4; 94/5. SUNDERLAND 76/7; 87/8; 90/1 (LC); 91/2; 92/3; 94/5. SWANSEA 96/7 (FAC), 96/7 (Auto). SWINDON 72/3; 82/3 (LC); 83/4; 85/6 (FAC); 86/7; 87/8 (LC); 90/1; 92/3; 94/5; 96/7 (LC). WALSALL 81/2, 81/2 (LC); 87/8; 89/90; 95/6; 96/7. WATFORD 69/70 £1; 70/1; 71/2; 80/1; 90/1; 91/2; 92/3; 93/4; 94/5; 96/7, 96/7 (Auto); 97/8. WBA 77/8; 79/80; 90/1; 94/5 (souvenir brochure celebration completion of new stadium £1.50). WEST HAM 76/7; 77/8; 80/1; 90/1; 92/3. WIGAN 84/5. WIMBLEDON 91/2 (FAC). WOLVES 78/9; 90/1; 91/2. WREXHAM 80/1; 97/8. YORK 82/3 £1; 84/5 £1; 85/6 £1; 86/7 £1; 87/8 £1; 96/7 £1; 97/8 £1. FRIENDLIES & TESTIMONIALS (Aways) – at Mansfield 95/6; Swindon 93/4 (White Test). ANGLO SCOTTISH (Aways) – at St Mirren 78/9 £1.20. PLAY OFF FINAL – 87/8 at Walsall (replay). FINALS (Aways) – at St Mirren 79/80 Anglo-Scottish Final £1.50. LEAGUE CUP SEMI-FINALS (Away) – at Tottenham 70/1 £1. 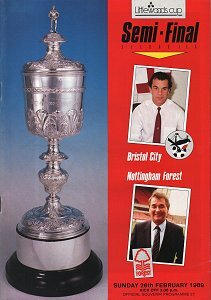 MISCELLANEOUS – 92/3 Swindon v Birmingham (contains reproduction programme 1945 Swindon v Bristol City) £1.